Most people are familiar with the makeup and history of Garden Key due to the historic Fort Jefferson that still stands there. The other keys each have a unique geography and history. The keys are all low-lying and many disappear and reappear throughout the years. The most prominent and developed of the isles are Loggerhead and Garden Keys. Some of the other isles have thin mangrove growths or other sorts of vegetation. Others are merely patches of sand or grass. Currently there are a total of seven islands or keys. Loggerhead Key is the largest of the isles. It even rises above sea level a whole three meters high. The island takes up 250 by 1200 meters in area and houses the Dry Tortugas lighthouse. Garden Key is the most popular of the islands and the place where the two Dry Tortugas ferries dock. 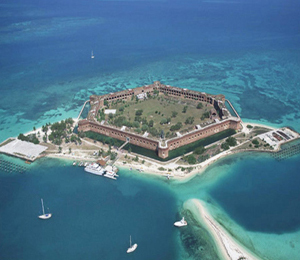 Here is where you'll find the historic Fort Jefferson where confederate war prisoners were held during the Civil War. This is also the only key were visitors are allowed to camp. Bush Key (formerly known as Hog Island due to the hogs that were raised on this island in order to feed the prisoners of Fort Jefferson) is very close to Garden Key and, if the tide is low enough, is actually connected by a small sand bar. Bush Key is off limits during April through September because of the large population of terns and noddys (types of birds) that next there during those months. Long Key is about 50 meters south of Bush Key and is a mid-sized Tortuga island. Hospital Key is where a small hospital was constructed for the residents and prisoners of Fort Jefferson. Middle Key is only about 2.5 kilometers east of Hospital Key. This island, due to its low sea level, often disappears completely for weeks or months at time due to various seasonal, weather, and tidal conditions. The smallest of the keys is East Key, measuring a mere 100 by 200 meters. The feeling you get being out in the Dry Tortugas is hard to describe. These islands are tiny and out in the middle of the gulf, with the only other visible land being the other equally small islands. There is no running water or electricity on these islands. Outside of the boats and the lighthouse, they lack any sort of modern technology. On top of that, the Tortugas feature the absolute best snorkeling anywhere in the Caribbean. Unlike in other spots where you have to take a boat out to the coral reef gardens, the Dry Tortugas offer you the coral reef right off the shore. You simply strap your snorkeling gear on and head into the water for the most lush and vibrant coral reef gardens in the Gulf of Mexico. You will want to come back to the Tortugas over and over. The islands of the Dry Tortugasit is a truly unique experience.